When I first stumbled upon the comic series The End I was given a copy of The Punisher’s version. This turn into an and curious intent to know how more of the favorite marvel characters meet their end. One unlikely hero (in my personal taste) stood out amongst the rest was that Incredible Hulk. I never was too fond of the big green guy throughout my comic reading days, but oddly enough loved the TV show as a kid, go figure. Maybe due to the Hulks Incredible power (no pun intended), from Leaping ridiculous amounts of miles, to using his massive strength to do well anything. 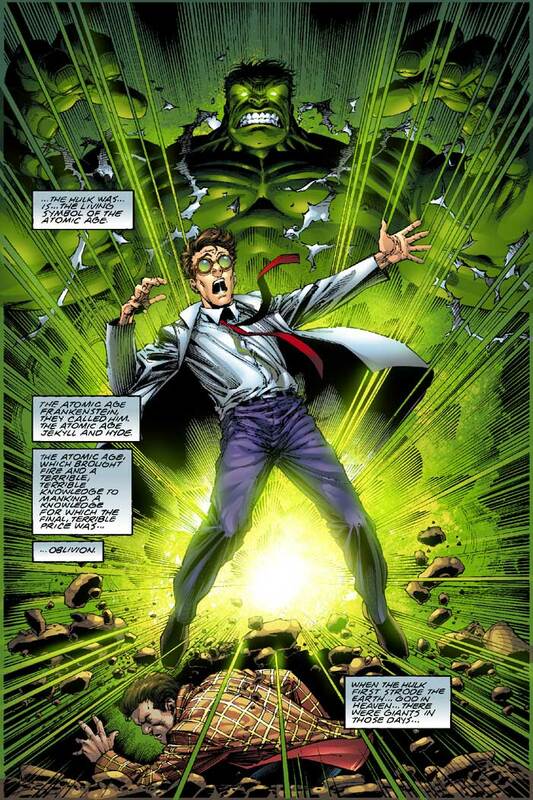 He always felt unreal and over powered, but I learned from reading this comic that the deeper meaning of the Incredible Hulk’s story is the mental play between Bruce Banner and the Hulk. This fantastically told tale of the Hulk’s end exhibits this very well as Bruce/Hulk are completely alone on earth, due to a nuclear fallout that has completely wiped out all life on earth including the Avengers, the X-Men and the like. Much like his physical body his mind is also in desolation and without any human contact he lives within his own subconscious which has become completely separated from the Hulk within him at this point. His only means of contact with anything is a robotic recorder sent by the Watchers to chronicle the behavior and actions of the last life form on earth (looks kinda like Halo’s Guilty Spark). One of the things this recorder does for Bruce is show him a time lapsed account of the Hulks ability to completely regenerate his body after being gorged by giant mutated cockroaches (probably due to the nuclear waste or over time with no predators its not really explained) At one point Bruce is so incredibly exhausted with the exercise of watching images like this (and life itself) he tries to kill himself as unconsciously as possible, but because the Hulk doesn’t want to die he quickly realizes what Bruce is trying to do to himself and transforms. Now this surprised me, because herein lies the deeper meaning of The Incredible Hulk; before time Bruce would become the Hulk in times of heavy emotional stress, fear, and anger and at one point even learned to control it somewhat to keep the monster mentally tamed. I don’t know if it’s due to Bruce’s old age or his will to even care anymore, but the Hulk seems to have control over when he will transform, having said this the Hulk is inadvertently acting as Bruce’s protector at this point just based on basic survival for himself. Of course, being to brutishly minded to realize this is spiritually killing is weaker or “puny” counterpart as the Hulk would say. I was completely blown away by this concept when I read this comic and it changed my entire perspective of the Hulk totally. In Hulk’s mind all he cares about is to outlive and survive everyone and everything. Even early on in the comic the reason why Bruce/Hulk survived was due to the Hulk wanting to get away from the noises and locking them away in a rock filled crevice of a mountain. Realizing or not realizing the noises were of war and screams of the battles of earth. 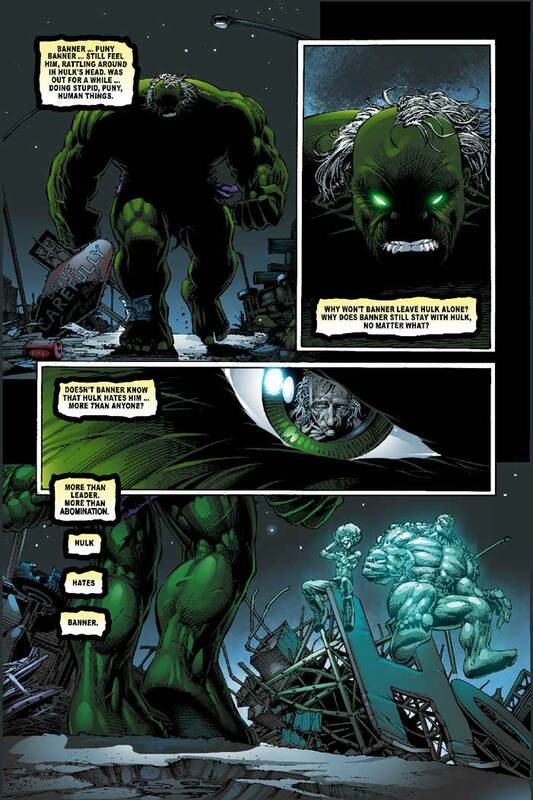 Without giving any spoilers Bruce and the Hulk do meet an “end” but I’m curious to see what you guys and gals interpretation was if you get a chance or if you’ve read this before. Peter David’s writing and Dale Keown art style do a fantastic job on conveying this story to the reader, oft times you’ll feel the aloneness just by the way Bruce speaks and the darker tone used in the penciling. 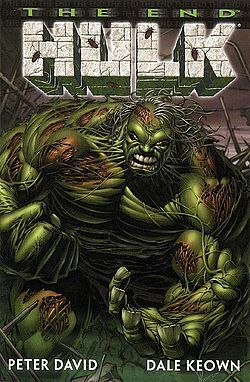 They have many more The End series with other favorites like Wolverine, The Punisher, even Marvel as a whole, but if you haven’t checked out The End series I recommend you start with The Hulk. Posted on July 6, 2011, in Books, Comics and tagged Comics, Dale Keown, Incredible Hulk, Marvel, Peter David, The End. Bookmark the permalink. 1 Comment.